Look out for the Rally? Deflating the earnings bubble may well be a slow affair, barring a hard global landing, leaving room for bear-market rallies, even if the likely earnings fall points to new market lows later this year. There is then typically a bear-market rally before the move to the lows. 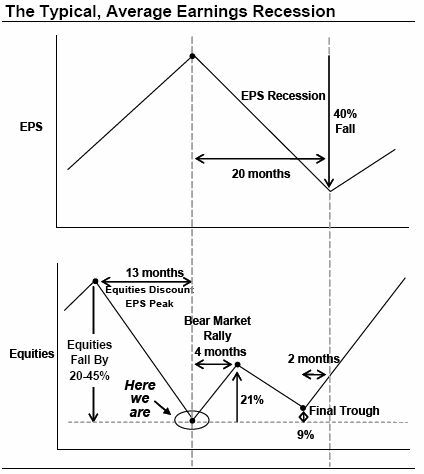 The market bottom occurs before the low in earnings. That low would provide the best entry point to what could be a large rally in non-US equities next year. I don't speak at "pay for seminars" --- haven't for years. I want to help others understand what is going on and how to make decisions for themselves when I am gone. I am Not in the conspriacy business....I have friends that fight that battle. I only provide facts that I know through contacts, research, and years of experience. Once we get to 1650 I will take you one step at a time beyond that. 2011 is when this WILL happen based on hard market basics....not pulling from hat. My suggestions are conservative, no pressure. Please get your house in order. ALL derivative losses occured at the SAME time....and were made worth 11-12 cents on the dollar. We see now the story slowly being told. The inventors of the first derivatives went to jail in 1992(Manco and Edelman spelling? - Southern District of NY) as the courts ruled they were a scam as they did not hold enough liquidity to create that much profit. However, years later people brought them back as they made so much profit. 40-50% of the earnings for most firms over the past few years. ---however LAW was not considered when they were created. Huge numbers of Homes can't go into foreclosure because it's been securitized and sold so many times....who owns the loan ???? - we are seeing this now in the news. This will probably change quickly as they will realize this fully and declare "economic emergency" and lobby to change the law quickly. This change in WORLD finance (all over) has put us all in jeopardy. Unlike 1980 after gold finishes it's great move - it will NOT go down. When many gold mining companies hedge their gold who is taking the other side of the deal??? - it's pretty much the same group Each time. When Ashanti Gold blew up do to their gold hedges a few years ago the details showed that Goldman Sachs was first adivsor....but was just acting on behalf of another entity...."The Carlyle Group"....(It is mentioned in fine print on many details of this company in the Grand Caymans). This is the company (or Carlyle acting for another group?) that is literally acquiring the world's future gold production through contracts with mining companies. This is NOT a conspiracy, it's not only legal, it's Brilliant ! This group is so powerful (possibly the most wealthy company in the world but not mentioned in rankings as it's private) that they will NOT allow 1980 Gold drop to occur this time. They have so much at stake already, it won't be a replay. Gold won't crater. US Dollar won't tank completely as this company has and will have the majority of their wealth denominated in it. This is why I say that Silver is a game. Though it will probably outpace gold on a percentage basis - it will drop and gold with stay high. However, a lot can be made in Silver but it's not the same situation as gold. A new Vehicle will be introduced into financial markets.....just as Gold hits it's peak in early 2011. It will probably dip just a tad from there but this new vehicle will be financial instruments attaching the US Dollar to the gold price. The currency will IMMEDIATELY be strengthened and bad perception changed overnight. US Dollar collapse stopped and bull created. (Major impact on pysche). THIS WILL COME TO FRUITION. Price is Preceding Time (Gold rocking to almost a 1000 now) .......so this would say that my 1650 conservative as my target is based more on the time of the event in 2011. ---- I will take you through it all and tell you within 50-100 dollars of the peak of Gold. No particular gov't admin set this up, they have just been chapters that have been in the works for a long time. How do I know this? I have connections in the highest places that have told me and have now allowed me to talk about it. (Few will actually believe or understand).......IT IS COMING - it matters not who knows now. Weimar Republic Experience is the closest thing to what we are in. The Germans purposefully devauled their currency but it got out of hand and they couldn't control it. Their currency went to zilch. The USD decline could also get out of control........BUT that is exactly why they have the new mechanisim in place !!!!!! US losing status as top dog. Economics: China will be #1, and India & US will duel for 2nd and 3rd. US does not believe this and does not know....it is unstoppable. All minerals will have HUGE upside, gold just one of them. Right now Junior Miners have been underperforming despite Gold rocking. It is mainly due to ratio spreads. Short the Juniors and Go long the Major using Derivatives, instruments based on mathematical concept...but on form of momentum concept that is now shifting. Machines are about to bust. Underlying assets way up, they will pop like popcorn! How High will Gold Go? Time is sooner, price is higher. There are points above 1650, but won't tell you yet verbally yet. There will come a point (soon?) where dissent could be / will be put down in a very harsh way. Reference the Kent State type incident potential in the future. Take for example the US/Canada military co-operation to deal with future civil disobedience that was just announced last week. This is but insight for what they are expecting in terms of cival unrest due to potential food shortages, rising costs, economic problems, etc. The key is that the United States isn't going to fall completely apart - but it is going to go through some major change...prepare now. WASHINGTON (AP) - Big investment houses took the Federal Reserve up on a first-of-its-kind offer Thursday to let them borrow Treasury securities and put up risky home-loan packages as collateral. It was the latest effort to ease a painful credit crisis. Most people don't appreciate it, but these cars are extremely valuable. After all - they're not making any more '59 Caddies! And based on my very complex, proprietary valuation model, the inventory you see above is worth a cool ten million dollars ($10,000,000). The problem is that I need money to run my business. I've got rent to pay, a payroll to meet, inventory to float and bills, bills, bills. I need money! But none of my regular (sane) bankers are interested in doing business with me. That is, no one will loan me enough money so that I can operate. Without money, I'll go out of business. This is also the sad situation that many banks, saddled with inventories of toxic debt, find themselves in. The program was announced earlier this month by the Fed and is intended as a booster shot for financial institutions (car dealers like mine in this example) and for the troubled mortgage market (classic car market)...Big Wall Street investment firms (car dealers) can borrow much-in-demand Treasury securities from the Fed and put up more risky investments, including certain shunned mortgage-backed securities (classic car inventories) as collateral for the 28-day loans. Basically, I can get a 28 day loan of Treasuries - the highest rated securities around. I'll pledge my classic car inventory (junk) to the Fed and in exchange, they'll give me the full value of my inventory - $10,000,000 - in Treasuries. Okay, probably not the full value, but close enough. Maybe the Fed will loan me 95% of the value. Much better than ten cents on the dollar. With these high quality assets on my books, regular banks will no longer be afraid of doing business with me, and will loan me the working capital I need to continue operations. After 28 days, I'll return the Treasuries to the Fed, plus interest - one third of one percent, according to the article. The Fed will return my classic car inventory. If there are still no bids for my junk when I get it back from the Fed, not to worry. Both the Fed and I will pretend that it is still worth $10,000,000, and we'll do another loan, which will allow me to stay in business for another 28 days. Theoretically, we can keep doing this until the market has bounced back...or something else happens. That is my honest understanding of how the TSAF works. Crazy world, isn't it? The Fed has gotten itself into a new line of work. Previously you could think of the Fed as an immense mutual fund that bought only Treasury securities. Not exactly, but that was kind of asset structure it had. The Fed is a bank. On the assets side of its balance sheet are mainly Treasury securities. On the liabilities side are Federal Reserve Notes. That was then. Since December when the Fed started getting into the business of helping to revivify the mortgage market (in our example, the classic car market), the Fed has taken on credit risk. That is to say it has accepted collateral against which it lends Treasury securities … and its collateral is something new and different. It is mortgage backed collateral (junk). The Fed preaches a good game of transparency, but it holds its cards rather close to its chest. We don't know exactly what kind of collateral the Fed is taking. We do know that it is taking new things - mortgage backed things. Its website will tell you that it is giving these securities a very, very light haircut compared to the kind of discounts that Wall Street firms would take. The Fed, at least according to its website is much less aggressive in marking down the value of them. So one would expect that the banks and brokerage firms seeking accommodation would put forward their less desirable collateral. The question is, why oh why is the Fed doing this? Is the Fed that fearful of deflation? That seems to be the standard line. But one thing that I have come to understand about the Fed in recent years that it is predicated upon deception. Look no further than the term of Alan Greenspan, who was the ultimate deceiver, for evidence. Viewed from this perspective, what is the Fed's ultimate goal? As Grant correctly points out, savers are being decimated by the Fed's policy of low interest rates, high inflation and a weak dollar. But a nation's savings forms the necessary capital base for productive future investment. Capital investment is required for healthy, long term economic growth. Asked in a different way, why is the Fed intent on destroying the US economy? More and more, it appears that in the 21st century we are returning to the economics of the 19th, where wealth was overwhelmingly concentrated in the hands of a few owners and astute speculators. Neither the Right nor the Left seem capable of creating a society in which all benefit from increased prosperity and economic security. Right-wing claims that free markets will enrich all sections of society are palpably false, while the traditional European welfare state appears to penalize innovation and wealth-creation, thereby locking the poor and unskilled into institutionalized poverty and unemployment. Thus in the new age of globalization, both ideologies create the same phenomenon: an underclass caught between welfare and low wages, a heavily indebted middle class increasingly subject to job and pension insecurity and a new class of the super rich who escape all rules of taxation and community. It was in Britain that neo-liberalism first emerged in its decisive form. Confronted with union militancy and the apparent bankruptcy of the welfare state, the Conservative party under Margaret Thatcher was elected in 1979. In America, Ronald Reagan took office in 1981, and the Anglo-Saxon countries have pursued and advocated free market liberalization ever since. Today, its reach extends as far as communist China, which, while eschewing political freedom, fervently preaches economic liberalization. This year even the French acknowledged free market supremacy, electing a president who has persistently denounced the costs of Gallic welfarism and praised the economic advantages of the Anglo-Saxon model. But the benefits of free market liberalization depend on who you are, where you are and how much money or assets you had to begin with. In terms of economic development, free market fundamentalism has been a disaster. The free market solutions applied to Russia during the Yeltsin years succeeded only in mass impoverishment, the creation of a hugely wealthy oligarchical class and the rise of an authoritarian government. Similarly, the growth rates of Latin America and Africa, which had been higher than other developing nations, dropped by over 60 percent after they embraced IMF-sponsored neo-liberalism in the 1980's, and have now ground to a halt. On an individual level, a similar story pertains. Real wage increases in the top 13 countries of the Organization for Economic Cooperation and Development (OECD) have been below the rate of inflation since about 1970. Thus wage earners - rather than asset owners - have faced a persistent 30-year downward pressure on their standard of living. It comes as no surprise to learn that the golden age for the wage worker, expressed as a percentage share of GDP, was between 1945 and 1973, and not under economic liberalization. Nobody questions that trade increases prosperity, and that the liberalization of credit and financial services allow hitherto excluded groups to supplement their wages by buying shares or houses and thus participating in the asset economy. But the real story of neo-liberal success is not the extension of assets to all, but the huge and disproportionate share of wealth attained by the very rich. In the United States, between 1979 and 2004 the wealthiest 1 percent saw an increase in their share of national income of 78 percent, whereas 80 percent of the population saw an overall decrease in their income share by 15 percent. That's a wealth transfer from the large majority to a tiny minority of some $664 billion. The traditional Left panicked in the face of neo-liberal hegemony and spoke in the 1980's of redistribution, higher taxes and restrictions on capital transfers. But, outside of Scandinavia, they were whistling in the wind: Traditional state-regulated economies appeared locked into high unemployment and low growth. A new path for the Left was offered by the country that first experienced the new Right: the UK. By the late 1990's, Britain was exhausted by Thatcherism; its public services were failing and the country was socially and economically fragmented. Thus in 1997 New Labor was elected. Under the guidance of Tony Blair and Gordon Brown, the new progressives promised that the benefits of rising prosperity would be applied to the public sector and the poor. Social exclusion would be tackled by opening up education and extending opportunity to all. The rest of the world was once more transfixed by the social experiment taking place in Britain. Could this seemingly exclusive neo-liberal circle be squared for the benefit of all? Sadly, after 10 years the conclusion has to be no. Poverty in Britain doubled under Thatcher, and this figure has become permanent under New Labor. The share of the wealth, excluding housing, enjoyed by the bottom half of the population has fallen from 12 percent in 1976 to just 1 percent now. Thirteen million people now live in relative poverty. Social mobility has declined to pre-war levels. The least able children from the richest 20 percent of the population now overtake the most able children from the bottom 20 percent by the age of seven. Nearly half of the richest group go on to get university degrees while only 10 percent of the poorest manage to graduate. Clearly, the New Left has entrenched class division even more firmly than the neo-liberal Right. This in a nutshell is the problem: Both Left and Right seem incapable of challenging monopoly capitalism. Neither welfarism nor statism can transform the lives of the poor, and neither, it seems, can neo-liberalism. Only a shared economy can correct the natural tendency of the free market to favor monopolies. But we can only share if all own. Thus there is a radical and as yet unexplored possibility - that of a general and widely distributed ownership and use of assets, credit and capital. This would dissolve the conflict between capital and labor since it would be a market without monopoly and a state where waged labor - since it was the owner of capital - did not need state welfare. Phillip Blond is a senior lecturer in philosophy and theology at the University of Cumbria. Again this week, we see one of Wall Street’s most “elder leveraged speculators” fall into serious trouble. A strategy that had worked so nicely for almost a decade turned unworkable. While sharply reducing the risk profile and degree of leverage from the LTCM days, Meriwether’s bond fund was nonetheless leveraged 14.9 to 1 (according to Jenny Strasburg’s WSJ article). As was the case with the Peloton fund and others, the most aggressive use of leverage had navigated to the perceived safest (“money-like”) instruments – “His funds’ losing positions have included mortgage securities backed by Fannie Mae and Freddie Mac, trades tied to municipal bonds and triple-A-rated commercial mortgage-backed securities”. Understandably, most fully expect Wall Street to rebound and the leveraged speculating community to emerge from current turmoil as it did following LTCM – albeit at a more measured pace. Some assume it’s merely a case of our policymakers “playing whack a mole” until they find the requisite instrument(s) to successfully beat down the sources of financial instability. Of course, I view things very differently, instead seeing Meriwether’s predicament as emblematic of an End of an Era - with huge ramifications for both the Financial and Economic Spheres. I would expect it will be quite some time before the marketplace (investors as well as lenders) grants Mr. Meriwether or similar leveraged strategies another shot at financial genius. Indeed, there is mounting evidence supporting the Bursting Hedge Fund Bubble Thesis – from the angle of the quality of underlying assets; from the capacity to leverage; from the ability to retain investors; and from a regulatory perspective. And keep in mind that the historic ballooning in the “leveraged speculating community” has been an absolutely instrumental – and extraordinarily opaque – facet of the Bubble in Wall Street finance and the overall Credit Bubble. I would argue forcefully that the leveraged speculating community for some years now has assumed the key role of unappreciated marginal source of demand for risk assets – risky debt instruments financing asset inflation, in particular. Over time, Wall Street “alchemy” mastered the process of transforming virtually unlimited risky loans into perceived safe and liquid securities. A sizable – and growing - chunk of these securities were then purchased on leverage by the rapidly expanding speculator community, in the process fueling an increasingly maladjusted U.S. Bubble Economy. We’re now witnessing it all beginning to wind down. End of an Era. It is today analytically imperative to differentiate the authorities’ focus on stabilizing marketplace liquidity from the Unfolding Bursting of the Wall Street Bubble. Our policymakers may be exerting meaningful impact on the former, yet the latter remains largely out of their control - and certainly thus far impervious to their actions. Especially when it comes to the key marketplace for agency securities, policymaker efforts are directed at sustaining perceived “moneyness” - through both governmental support (tacit guarantees and Fed liquidity operations) and a renewed bid for mortgages by the GSEs (Fannie, Freddie, and the FHLB). And while such efforts have important ramifications with regard to accommodating the ongoing de-leveraging process (and averting Credit system implosion), they are at the same time completely inadequate when it comes to generating sufficient new Credit to sustain U.S. Financial and Economic Bubbles. “Moneyness” will definitely not be retained in non-agency securitizations, especially as the economy falters. Debt problems are accelerating and expanding from mortgages to home equity, auto, Credit card, student loans, small business finance, munis and corporate Credits. At the same time, Wall Street has been significantly tightening lending requirements for the leveraging of all types of debt instruments. While the focus has been on mortgage Credit, recent deterioration in other types of loans – and, importantly, the leveraged holders of large amounts of this debt – have major consequences for Credit Availability throughout the Economic Sphere. Housing markets and foreclosures are obviously major issues. Not commonly recognized is the now virtually across the board tightening in Credit throughout the securitization markets (consumer, student, muni, corporate, etc. ), exerting more expansive headwinds upon the U.S. economy than even the tightening in mortgages (that predominantly impacted transactions and home prices). February California median home prices declined $20,550 to $409,240. Median prices are now down $67,140 in two months and a stunning $179,730 since August. Prices are down 32% from June’s high, and are now even 13% below the level from three years ago. Granted, these median prices are impacted by the dearth of sales at the upper-end. Yet it’s clear that the California market is in the midst of an historic crash. The Credit standing of Golden State households, businesses, and various governmental agencies now deteriorates virtually by the day. I would argue the explosion over the past three years in “private-label” mortgages, Wall Street balance sheets, hedge fund assets, and California home prices were all part of the same Bubble. This Bubble inflated largely outside the banking system and outside GSE finance – and will now prove stubbornly unaffected by policy maneuvers. Some argue rather forcefully that we’re now immersed in “debt deflation.” I understand the basic premise, but to examine double-digit growth in Bank Credit, GSE “books of business” and money fund assets provides a different perspective. To be sure, our Credit system continues to provide sufficient Credit to finance massive Current Account Deficits. And it is this ongoing outflow of dollar liquidity that stokes both indomitable dollar devaluation and global Credit excess. Many contend that inflationary pressures are poised to wane as the U.S. economy weakens. I’ll suggest that inflation dynamics will prove much more complex and uncooperative. There is further confirmation of this view - that the bursting of the Wall Street finance Bubble will have a significantly greater impact on asset prices than on general consumer pricing pressures. The analysis gets much more challenging in the commodities markets. The simple view holds that commodities are just another Bubble waiting their turn to burst. This thinking gained greater acceptance last week, with the sharp reversal of prices and unwind of speculative positions. And it goes without saying that major speculative excess has developed throughout the commodities complex ("par for the course"). I am as well sympathetic to the view that liquidations by the leveraged speculating community could lead to some major price instability. Yet it’s my sense that there really is much more to the commodities story – and inflation, more generally – that is not widely appreciated. The bursting of the Wall Street finance and U.S. Credit Bubbles marks an End of an Era. But the start of a deflationary spiral? Importantly, these bursting Bubbles are in the process of consummating the demise of the dollar as the world’s functioning “reserve currency” and monetary standard. Examining global markets, I note the ongoing strength of currencies in China, Russia, Brazil, and India, for example. Considering mounting financial and economic imbalances in all these economies – not too mention histories of less than exemplary monetary management – I can state categorically that these are fundamentally very weak currencies. Today, however, it’s all relative to the sickly dollar. In the face of rampant domestic Credit growth, these currencies nonetheless attract endless global finance and appreciate. When it comes to Ending of Eras, I am increasingly fearful that we are falling deeper into a precarious period devoid of a functioning global currency regime necessary to discipline Credit excess and restrain mounting inflationary pressures. And as long as dollar liquidity inundates the world economy, domestic Credit systems across the globe enjoy the extraordinary capacity to inflate domestic Credit and use this new purchasing power for the benefit of their citizens and economies. And, in particular because of their enormous populations, as long as the Chinese and Indian Credit system enjoy the freedom to inflate at will there will remain significant upside pricing pressure for energy, food, and various goods and commodities in limited supply – hedge fund speculative excess and/or bust notwithstanding. I throw this analysis out as food for thought. I am increasingly of the mind that commodities should be differentiated from U.S. financial assets when it comes to the consequences from the bursting of the Wall Street finance and leveraged speculating community Bubbles. Prices will likely remain hyper-volatile but (unBubble-like) well-supported by underlying fundamental factors. Similarly, I believe general inflationary pressures may likely prove more significantly influenced by runaway global Credit excesses than by the Wall Street and U.S. asset price busts. If this proves to be the case, perhaps the greater risk is a bursting of the Treasury Market Bubble. It may take some time, but an enormous supply of government debt is in the offing and – let’s face it – these instruments will become only less appealing over time. It also begs the question as to the advisability of aggressive Fed rate cuts. They are having little influence on the bursting Wall Street Bubbles but possibly huge effects on global inflationary forces. Little wonder the ECB is so hesitant to lower rates. Commodity market is no country for old men. How about the zombie who, according to rumour, decided to electronically sell Â±10,000 wheat contracts (spot month, short sale) even at when the bins were nearly empty? Apparently the trade was done in the wee small hours of the morning and, of course, it was unwound hours later (at a loss of one or two hundred million) and one more speculator bit the dust. Meanwhile platinum swings a hundred dollars a day and amplitudes in grain markets are sometimes greater in a day than their prices were two years ago. Wheat used to trade in increments of half a cent; now we're getting increments of close to 10 cents. Silver, which was friendless at $4 five years ago, unobtrusively moved through $20 before a savage pullback. God only knows what gold will do as and when it gets well clear of the magic $1,000 number. Finally peak oil seems to have arrived. The only thing that will stop the price rising will be serious declines in US consumption, because it appears nothing will stop the rest of the world consuming more. And more. While establishment economists suggest, hope, and dream that the commodity boom is over, in all likelihood it's just beginning. That ill-advised short wheat trade is just a manifestation of frustration, incredulity, and, probably, a harbinger of things to come. Just as a lot of smart investors intended to "get out of" sub-prime products before any trouble started but were all caught instead, so a lot of smart investors have been caught short gold, grains, and so on. As always, they lament that the pullbacks have not been deep enough, or long enough, to permit covering (or going long). And just as the people long sub-prime stuff found that there were no bids when they tried to exit, so the commodity shorts will find offerings scarce when they try to cover. Yet for the moment, even as manifestations of inflation intensify, the popular wisdom is that commodities have been in a bubble phase. Nobody is worried about the integrity of money. Nobody sees well-publicized financial upheavals as propelling the flight out of money; rather, economic gurus argue that safety lies in holding cash or bonds. The latter remain strong and it's still the mortgage/sub-prime/Bear Stearns/hedge fund stuff that makes the headlines. Soon enough it will be derivatives, and then perhaps people will grasp that this is a money problem more than anything else. In fact the monetary system is moving into its death throes. Back in the early 1960s, when the first cracks in Bretton Woods and the US dollar appeared, the predecessors to the G7 cooked up the General Agreement to Borrow (GAB) with a whopping $6 billion aid package. Another innovation that was supposed to solve the world's problems was the introduction of Special Drawing Rights (advertised as "paper gold"). The usefulness of the International Monetary Fund has faded; there is certainly no way it will be permitted to discipline its most truant member. Whatever, some members would like to recover their gold from the IMF, while others would like to use IMF gold to suppress the gold price. Either way, there's a good chance that the IMF will be gone within the decade. Moving to a different arena, we paid a visit, after a generation's absence, to the recent PDAC (Prospectors and Developers) convention in Toronto. What a change. A generation ago it was like a produce market with a few hundred grizzled prospectors from Chibougamou, Timmins, and Yellowknife all trying to sell claims to Noranda, Conwest, Kerr Addison, and the like. We once even cut a property deal in the smoke-filled, alcoholic haze of the Royal York Hotel's Library Bar. But during this last visit we didn't see any prospectors, just 20,000 slick, expensively dressed men and women working out of 400 booths selling stock, not mineral claims. more for the bigger ones. Collectively they have been pulling billions out of the market for years with pitiful results. The days of investment dealer black-box paper are over, credit is tighter (even though marginally less expensive), and promotional mining la-la-land looks to be in for a shakeout. wealth (such as P&G or CAT) will thrive and prosper, along with resources, long after the money is gone. Gold, the real thing, will probably outperform most shares. Last month we delivered a lecture at Southern Methodist University to our Oil & Gas Law class on the 'New Era of Oil: The Age of Scarcity'. This is not a standard law school topic, but relevant when discussing the legal history and development of market demand prorationing, allowables, and conservation regulations. Our thesis is that we are entering the fourth era of the oil age – one the world economy has never experienced before. This era will cause many disruptions, but will also create investment opportunities that arise only once every few decades. From the discovery of crude oil in the Drake well in Pennsylvania in 1859 until the East Texas Field discovery and development in the early 1930’s we had a situation where supply was growing exponentially. Increases in demand did not keep pace so the price of crude oil plummeted. Governors shut in oil fields to prevent overproduction and waste. Arising from these problems the Texas Railroad Commission and other regulators obtained the statutory authority to restrict incremental oil production to match global demand. The second era lasted 1930 to 1972 as state regulators like the Texas Railroad Commission restricted production to stabilize the price. When the production of crude oil peaked in the U.S. in 1972 the role of the Railroad Commission in restricting production passed to the Organization of Petroleum Exporting Countries – the third era of oil. In each of the first three oil eras we had excess productive capacity to meet the rising global demand and any short term shortages that occurred. Going forward we find ourselves in the position where global demand for crude oil is now approaching the ability of the world’s producers to extract production – and soon demand will exceed productive capacity. For the first time ever we will have no excess global productive capacity to meet growing demand. In such an era – never seen before in the global economy. (10) as a result of the extreme increases in food and fuel prices we expect to see food shortages, instability, riots, and the like in less developed countries. One of the most significant developments we expect to see, besides much higher energy prices and volatility, will be the interconnection of the global energy and agricultural markets – tied together by biofuel initiatives. Adequate capital has not been allocated to the energy and agricultural sectors in the face of global physical and political challenges – and that historic misallocation creates great opportunities for business in these sectors. The energy and agriculture markets are quickly converging, which points to much higher prices for both commodities. Because of these trends we remain heavily over-weighted in the energy and agricultural sectors. The evidence of a new era for both energy and agriculture – reflected in global production and demand data – is compelling. The ''gold bugs,'' as they often are referred to with more than a hint of disdain, find gold appealing because they believe it represents the one enduring form of nonstate money. ''Money is far too important to be left in the hands of bankers, Congress or the Federal Reserve System,'' Gary North, a legendary gold bug who has edited financial newsletters for decades, told me via e-mail. North's Web commentaries include everything from advice regarding prostate problems (saw palmetto has helped his immensely) to a recently completed 700-page ''economic commentary'' on the Gospel of Luke, which he encourages readers to download onto their hard drives, in case he were to ''drop dead and the site is taken down for any reason.'' But the focus of his writings is politics, and North's politics aren't hard to pin down. His is the fierce libertarianism of the ardent gold bug. I had sought out Casey and North, two leading voices among gold enthusiasts, because after 20 years during which paper assets -- stocks, bonds, and the world's leading ''fiat currency,'' the dollar -- soared, gold was making a comeback. If you bought $10,000 worth of gold in 1980, by 2001 you would have lost $6,800. But then the long bull market in stocks ended, and the dollar, responding to the growing debt burden of the average American, not to mention the federal debt and our trade deficit, began a steep decline. And so, starting in 2001, gold, which like many commodities moves in the opposite direction of the dollar, began to recover some of its lost glamour as a store of value. The price of gold broke through the $300 barrier in February 2002, then the $400 barrier at the end of 2003. Could this be the dawn of the apocalypse that the gold bugs, whose prevailing attitude might best be described as a wishful pessimism, have been predicting? Could the dollar collapse, leaving only gold? For the past 70 years, the United States has been conducting an experiment regarding the dollar. The experiment asks: Can the United States manage its currency responsibly, without having that currency backed by gold? The U.S. effectively went off the gold standard twice in the 20th century, and both times responsible men in positions of power foresaw cataclysm. ''This is the end of Western civilization!'' Lewis Douglas, Franklin Roosevelt's budget director, declared in 1933, when Roosevelt terminated the right of American citizens to demand gold in exchange for their dollars. ''Pravda would write that this was a sign of the collapse of capitalism,'' Arthur Burns, chairman of the Federal Reserve, warned Richard Nixon in 1971, when Nixon terminated the right of our international trading partners to demand gold in exchange for their dollars. James Sinclair is a 64-year-old American businessman in a tan blazer and navy blue slacks. From his manner and dress, he could be host to an Amway seminar. But when he speaks, he sounds more like a karma yogi. It's as if you're watching a movie dubbed with the wrong soundtrack. ''Silence is deep rest,'' Sinclair told me as we waited for sandwiches at a deli. ''It's the only way to restructure ourselves.'' Among the most famous gold speculators, Sinclair proclaimed in the 70's that gold, then at $150 a troy ounce, would hit $900. (It eventually peaked at $887.50; he sold his position the following day, for a profit of more than $15 million.) Then, with some analysts predicting that gold could go as high as $2,000, he declared the gold bull market dead. (Within months, he was proved right.) In 2001, with gold near its bear-market lows, Sinclair told Forbes magazine that it could hit $430. On the day I met him, gold was trading at $434. The Daily Reckoning is a freewheeling Web site for libertarians, gold bugs and doom enthusiasts of every stripe. Its editorial director is Addison Wiggin, and before we met, I pictured an ''Addison Wiggin'' as an ancient gold-hoarding Yankee, and the offices of The Daily Reckoning as a cinder-block bunker patrolled by Minutemen. I was wrong on both counts. Wiggin is a sober, black-clad 37-year-old who is active in libertarian circles. The Daily Reckoning, meanwhile, is nestled in the lovely Mt. Vernon section of Baltimore, and its interior could pass for any 1990's dot-com, with a glass-enclosed conference room, exposed brick walls and a couple of nerdy 20-somethings in sneakers and T-shirts. The narrative Wiggin spun out for me over lunch is repeated, nearly verbatim, by almost everyone in the gold community. ''This is the blow-off phase for the Great Dollar Era. We're in an unsustainable trend right now,'' Wiggin told me, ticking off the miscalculations that have brought us to the brink of an economic apocalypse. To begin with, the U.S. has become the world's biggest debtor, with three outstanding obligations at alarming highs: consumer debt, or our mortgages and credit cards; the federal deficit; and our current account deficit with foreign countries. Federal Reserve Chairman Alan Greenspan, Wiggin continued, has simply shifted one bubble -- the 90's bubble in stocks and bonds -- into another, in real estate and ''overconsumption,'' or the American propensity to pay for an ever-more-lavish lifestyle on credit. Wiggin offered up his analysis with a confident and steady aplomb. And for good reason. While no one in the mainstream financial elite seriously advocates a return to the gold standard -- the modern global economy is too fluid and dynamic for such austere discipline -- at this moment, the gold bugs' grim prognosis for the dollar happens to align with a more mainstream view. A low-level panic about the debt crisis, and its possible effect on the American economy, is gathering strength. ''Our little post-bubble workout is not over, not by any stretch of the imagination,'' Stephen Roach, the chief economist at Morgan Stanley and himself a noted pessimist, told me recently by phone. Roach says he firmly believes that an adjustment is necessary and inevitable, and that when it comes, it will be very, very painful. From appearances, Warren Buffett, the savviest investor who ever lived, agrees. His company, Berkshire Hathaway, has placed a $21 billion bet against the U.S. dollar. Money is entirely conventional. It's a system of equivalence, a medium of exchange. In a society of any sophistication whatsoever, money is used reflexively. You hand me 50 cowrie shells, I give you a head of cattle. I give you a 20, you give me a tuna on rye and some change. As the greatest theorist of money, the German sociologist Georg Simmel, recognized, money is only money when it is in motion: ''When money stands still, it is no longer money according to its specific value and significance.'' Furthermore, the set of conventions that lend money its credibility as a medium of exchange must be universal and stable, so that the shells for which I relinquished my good cow today will be worth as much tomorrow, when I exchange them for something else. Money is built on motion and trust. Gold, like everything else, is a commodity whose price is established by supply and demand. But gold is unlike everything else in that an ancient fantasy of solidity attaches to it. We produce things, but to exchange them efficiently, we throw over them what economists refer to as ''the veil of money.'' Interest rate swaps, swap curves, swaptions -- the veil only thickens with time. If the gold bugs are apocalyptic, it's worth recalling the etymology of the word ''apocalypse'': to uncover or reveal. Gold holds out the promise, however chimerical, that one day we might pierce the veil of money. WASHINGTON (AP) - Big Wall Street investment companies are taking advantage of the Federal Reserve's unprecedented offer to secure emergency loans, the central bank reported Thursday. Those firms averaged $32.9 billion in daily borrowing over the past week from the new lending facility, compared with $13.4 billion the previous week. The program, which began last Monday, is part of the Fed's effort to aid the financial system. On Wednesday alone, lending reached $37 billion. The Fed, for the first time, agreed on March 16 to let big investment houses temporarily get emergency loans directly from the central bank. This mechanism, similar to one available for commercial banks for years, will continue for at least six months. It was the broadest use of the Fed's lending authority since the 1930s. Last week, Goldman Sachs, Lehman Brothers and Morgan Stanley (MS) said they had begun to test the new lending mechanism. The Fed does not release the identity of the borrowers using the facility. The Fed created a way for investment firms to have regular access to a source of short-term cash. This lending facility is seen as similar to the Fed's "discount window" for banks. Commercial banks and investment companies pay 2.5 percent in interest for overnight loans from the Fed. Investment houses can put up a range of collateral, including investment-grade mortgage backed securities. WASHINGTON (AP) - Big Wall Street investment companies are taking advantage of the Federal Reserve's unprecedented offer to secure emergency loans. The central bank says those firms averaged $32.9 billion in daily borrowing over the past week from the Fed's new lending facility. The report Thursday does not identify the borrowers. The lending program is part of the Fed's major effort to help the financial system. After a one-day reprieve from total meltdown in the financial markets, news media cheerleaders for the most reckless gang of bankers in world history declared the crisis over on Good Friday (with the markets safely closed). Whew, that's a relief. Problem solved. And just in time for baseball season, too, so none of the Banker Boyz have to sell their sky box leases. What is meant by "meltdown," by the way, since the word is used so promiscuously by myself and others. I'd define it as the shock of recognition that many big institutions are worse than flat broke and are therefore powerless to conduct normal operations. By "worse than flat broke" I mean they are so deep in hock that all the accountants who ever lived, in the life of this universe and several others like it, using the fastest parallel processing computers ever built, could not keep up with their compounding accelerating losses (now approaching the speed of light). For the moment, with the crisis "contained," and the Boyz getting ready to air out their Hampton villas for the coming season, we are once again primed to be blindsided by potent random events that nobody saw coming. The trouble is, there are enough potent potential fiascos already visible on the horizon. The mortgage fiasco is still just gathering steam as it moves from the non-payment stage to the default and repossession level on the grand scale. Even the political wish to bail out feckless mortgage holders will stumble on the mammoth clerical task of administrating the process, especially since we've barely begun to sort out who actually holds the mortgages after they've been minced into a fine mirepoix of securities off-loaded onto countless dupe "investors" ranging from municipal funds in obscure corners of foreign nations to countless public employee retirement plans. No matter how the authorities try to "nationalize" the sucking chest wound of bad mortgages, the body of finance will flat-line -- and the American public will get stuck with the bill from the intensive care unit. Those who, for some weird reason, continue to pay their way and meet their obligations, will be none too pleased to pay for misdeeds of the deadbeats and their banker-lenders. This portends a taxpayer rebellion, which may translate into a voter rebellion. It's too bad the current presidential candidates have been unable to address the unfolding economic nightmare. Their collective silence on the matter suggests that they don't have a clue what to say about it. As the nightmare plays out and black swans flock in to blot out the sun, and the hedge funds come a'tumbling down, and more big banks blunder into black holes, and businesses big and small across the land shutter up their operations, and the unemployment rolls swell, and families are thrown out of their houses even when bailouts are supposed to be saving them (but the bureaucracy can't get the paperwork done in time) -- well now, they are going to be one pissed off bunch of people. What will they do at the conventions? Our outside the conventions? In the deeper background of all this is the all-important oil story that nobody in politics or the media wants to pay attention to. Notice that in the fervid unloading of assets this past week, as investors dumped their positions in the commodities markets, the price of oil remained stubbornly above $100-a-barrel when it was all over on Thursday afternoon. Well, maybe they'll ratchet down a little further this week, but the trend line will prove to continue remorselessly upward in the months ahead. Peak oil is for real. The supply can't keep up with global demand, even if it dips in the USA. And more portentous sub-plots develop in the story every month. Export rates are falling at a steeper rate than depletion rates. The exporting nations are not only buying more cars and running more air-conditioners, they also need to use more energy to lift the oil they've got out of the ground. Another sub-plot is the fact that the equipment used world-wide to drill for oil and recover oil and move oil around the planet -- all that equipment is now so old and rusty that it can barely do the job, and it is going to start failing altogether unless investments are made to replace it, which nobody is making. By the way, Americans blame the familiar private oil companies for all the trouble with oil in their lives -- Exxon-Mobil, Shell, et al -- but they don't seem to know that oil nationalism is in the driver's seat now. The old private "majors" are only producing five percent of the world's oil. The rest is coming from the national companies -- Aramco, Petrobras, Pemex, et blah blah -- and the very operations of the oil markets are entering a phase of radical instability as they move away from auctioning their stuff on the futures markets and start making long-term favored customer contracts instead. The bottom line is that high prices for oil is hardly the only thing America has to worry about. Pretty soon the US will have to worry about getting the oil at any price -- meaning, we're in for shortages and supply disruptions sooner rather than later. Also unbeknownst to most of America, the financial markets reflect all this instability around the basic resource of oil because industrial economies like ours are set up in such a way that they can't run without cheap and reliable supplies of the stuff. So the least little twitter in the reality-based world of peak oil means that everything to do with money and capital investment will naturally go batshit, since our expectations for increased wealth -- i.e. "growth" -- are predicated on the activities driven by oil. It will be interesting to see what new machinations are unveiled this week. Whatever else this catastrophe is, it's a good show from the cheap seats. The Shape Of The Future - Very different!!! Three months ago, we wrote, "[T]he economic malaise will not be brief, even though its depth is uncertain. The process is going to be like water torture - drip by drip by drip over an extended period of time until all these excesses are squeezed out of the system and new and happier horizons can open up." This metaphor should now form the basis for all decisions, strategies, and analysis. Recessions matter, but the important features of the problems faced by the American economy are not in the short run. The crucial issue is the nature of the new longer-run environment that we are convinced is now a reality. This environment is still in its infancy, but its principal features are already identifiable. Too few people are thinking along these terms. The short run always tends to dominate mass thinking in any case, but in an odd way the short run is irrelevant to the current situation. The short run is a creature of the immediate past. The longer run will be a profound break from the past. Indeed, the longer run in this instance is going to evolve as it is going to evolve whether we have a perceptible recession in 2008 or whether we squeeze by with a minimum of negative numbers. Why are we so emphatic about this viewpoint? As Goldilocks shreds, we have to start thinking about what kind of long-term environment is going to replace it. Shifts to new environments are always attenuated. They are also rare across time, which means most of us have limited experience with this phenomenon. New environments often tend to sneak up on us and do not announce themselves with a fanfare. Most of us are unaware of what has happened until enough time passes to provide good perspective. Imagine, for example, what would have happened if investors had been willing to think through the powerful positive implications of the disinflationary forces that set in during the early 1980s after Paul Volcker had turned the tide of inflation. Instead, backward-focused investors in fear of renewed outbreaks of inflation ignored the way these new trends would lead to a radical improvement in economic stability and opportunity. The record of long-term interest rates in those years is eloquent testimony to the bias toward the past: although yields on ten-year Treasuries broke briefly below 8% in the wake of the oil price break in 1986, they were back up over 8% in 1987 and averaged over 8% for the next two years. Meanwhile, inflation averaged only 4.3%. Clearly, nobody was willing even to think about what the victory over inflation could produce. Yet it would lead to Goldilocks - a remarkable change in the nature of the whole world - would miraculously emerge from the disinflationary environment. The discussion that follows begins with a few generalities about when and why old environments fade away and begin to yield to new environments. We analyzed this matter some time ago, but recent events provide a better perspective to our line of argument. We go on to explore how much of the old environment has disappeared, which then leads us to some speculation about how the new régime is likely to develop. Economic environments do not have a specified life cycle, like the business cycle. As I have argued elsewhere, economic régimes tend to persist as long as people are still trying to figure out what is actually going on. This effort strengthens the underlying characteristics of the environment and extends its life expectancy. Change, therefore, is unlikely until people finally arrive at the belief they understand what it is all about. Such a process has no definable rhythm. The arrival of understanding could come sooner or later, depending on the circumstances. Furthermore, this process applies to all environments, both prosperous and depressed, to the 1920s as well as to the 1930s, to the years from 1949 to 1969 as well as to the devastating decade that followed. The 1920s were doomed at the moment when the New Era became a common phrase and Irving Fisher explained that prosperity would last forever. The Great Depression continued until unremitting deflation and waves of bank failures convinced a new administration that the tie to gold at $20.67 an ounce was stifling the economy. In addition, a total reversal of tax-raising fiscal policy and restrictive monetary policy was both essential and urgent. The postwar prosperity of 1949-1969 lasted for over twenty years because it was grounded in doubt as everybody kept waiting for an inflation that failed to show up. Inflation remained low, to general surprise, even though output growth was high. Once people got the idea that high output would not automatically cause inflation, the sense grew that now nothing could go wrong - and so we entered another régime marked by the aggressiveness of monetary policy and war finance in the 1970s. The resulting inflation would rage for ten years before people recognized that a profound transformation of the conduct and targets of monetary policy was essential. The outcome, as mentioned above, was the transition decade of declining inflation in the 1980s, leading in turn to Goldilocks after about 1989. The Goldilocks environment was so benign it appeared to be a long sequence of happy surprises. Goldilocks was aptly named: low volatility in capital markets and in the real economy, low inflation, central banks in firm control, a healthy appetite for risk-taking in the business world that led to revolutionary technological change, the transformation of the "emerging" economies into "developing" economies, and the resulting boom in globalization. After the bursting of the dot.com bubble in 2000, the business sector of the real economy resisted the fever for devil-may-care risk-taking that ultimately infused the financial markets. As a result, Goldilocks had remarkable longevity. Its death-knell would wait until the financial markets finally got the message that high risks were not really high risks in a low-risk economy. Then the fundamental stability and growth momentum of the global economic system created a bulging appetite for risk-taking that led investors around the world to gorge on anything that looked risky. A point came when any trigger would justify ever-greater risk-taking. The actual trigger did not have to be housing, but (with hindsight) we can see housing was a logical candidate. No one seemed to doubt that home prices could ever stop rising. Debt had no ceilings. Just to make everything appear even better, housing requires financing, which was like handing a delicious and multi-layered chocolate cake to the world of finance and financial engineering. Professional investors learned how to clothe high risks in a low-risk format for sale to the Great Unwashed, and to a goodly number of the Washed as well. In the aftermath of the fervor for risk-taking, Wall Street and the mortgage banks have created many deep-seated problems for themselves. As an unhappy side effect, the business sector, a relatively innocent observer, is going to have to absorb much of the pain of curtailed consumer budgets and fewer exports to foreign nations affected by the turmoil in the U. S.
Human nature develops odd biases. In terms of the economy, memories of past environments are more heavily weighted by the disasters than by the positive achievements of the period. These disasters linger long in collective memories, influencing public policy and investment practice for extended periods of time. Fear of the double-digit unemployment rates of the Great Depression dominated economic policy from the end of the depression in 1933 to the late 1970s. As late as 1978, with inflation raging around 8%, Congress enacted the Humphrey-Hawkins Full Employment Act, providing for "the right of all Americans able, willing, and seeking work to full opportunity for useful paid employment at full rates of compensation." Paul Volcker's great achievement (and courage) were in his conviction he would never defeat inflation as long as he had to tread softly in limiting possible increases in unemployment. That constraint had to change. Volcker saw no alternative if he was to win the battle in which he had been put in command. As he carried out his campaign, the unemployment rate soared from under 5% in 1979 to nearly 11% in 1982, but inflation dropped from a peak of over 14% to less than 6% over the same period. Today's central bankers may make interesting observations about influencing inflation expectations, but everyone knows they must ultimately have the courage to see unemployment increase if their policies to contain inflation are to carry credibility and actually influence expectations. The Fed is in an uncomfortable position at this very moment, because the tradeoff has taken on an unusual complexity, with the job market softening while lingering symptoms of inflation are still visible. As we now move on into the post-Goldilocks environment, which unhappy memories are going to weigh heaviest? Worries about inflation are not about to vanish, but new elements are going to join in. Clearly, everything that led up to the credit crisis and the problems of home ownership will remain a central focus of attention for a long time. In addition, as we emphasized in our issue of August 15 of last year ("Memory Banks and Economic Policy"), the increased income inequality generated by Goldilocks has become a widespread popular concern, already making vibrations among members of Congress and candidates for higher office. As Bill Gross himself put it in strong words last August, "So when is enough, enough? Now is the time, long overdue in fact, to admit that for the rich, for the mega-rich of this country, that enough is never enough, and it is therefore incumbent upon government to rectify today's imbalances." The rhetoric of the election campaign is full of such talk. This concern will influence tax policy and spending policy for a long time to come. The repercussions in the financial system are our main concern here. Most of the current flood of analyses of the state of the credit markets concentrate on the problems of the present. This kind of information is little help. We need to develop a sense of how this situation is likely to evolve over time. To accomplish that goal, our primary task is to discover where the roots of the new régime are being planted. We now set out our own views along these lines. We begin with a few generalities. These generalities will lay the basis for the particulars that follow. Credit is always and everywhere a matter of trust. Where there is trust, anything goes, as the recent proliferation of so many structured financial instruments vividly demonstrates. When trust vanishes, the revival of the buoyant credit creation of the past becomes extraordinarily difficult. But without credit creation, economic growth and risk-taking are stifled. Liquidity is also a matter of trust to some degree. But liquidity has another feature that few people notice. Liquidity is a function of laziness. By this I mean that liquidity is an inverse function of the amount of research required to understand the character of a financial instrument. A dollar bill requires no research. A bank draft requires less research than my personal check. Commercial paper issued by JP Morgan requires less research than paper issued by a bank in the boondocks. Buying shares of GE requires less research than buying shares of a start-up high-tech company. A bond without an MBIA (once-upon-a-time anyway) guarantee or a high S&P/Moody's rating requires less research than a bond without a guarantee or lacking a set of letters beginning with "A" from the rating agencies. The less research we are required to perform, the more liquid the instrument - the more rapidly that instrument can change hands and the lower the risk premium in its expected returns. This emphasis on trust and liquidity in a well-functioning credit market provides useful insights into what is happening. Trust has vanished in many areas where it was taken for granted just a few months back. And when the ratings of S&P and its competitors lost credibility, paper that had traded on sight lost the liquidity it once enjoyed because now it involved far more research than in the past. These words are just an elaborate way of explaining why credit spreads were so narrow just nine months ago and so wide in today's markets. This abrupt shift in viewpoints has caused snarls in many areas of the credit markets. Over the longer-run, the most serious of these blockages is the disruption in the process of securitization. Securitization works only in an atmosphere of trust and where the paper involves a minimum of research. Without securitization, and without the lively derivatives markets that developed around the securitization process, the entire credit system loses an immense source of capacity, hindering deserving borrowers in search of financing and, as a result, the pace of economic growth. Until the system can restore trust and the related willingness to buy instruments on the basis of limited research (or even no research), the credit markets are going function below optimal levels. But restoring trust and liquidity is no simple matter. Securitization broke the old personal relationship between lender and borrower, greatly expanding the market for credit in the process. The old-fashioned way - when lender and borrower were essentially on a face-to-face relationship - was slower, more cumbersome, and, most important, far more limited in terms of capacity. In my days as a commercial banker, back in the late 1940s, the president of my bank said to me, "Remember this. I much prefer the customer to be angry at you because you denied him credit than for you to be angry at him because he failed to repay when due." That attitude sounds quaint today, but it was very much in the spirit of a time where jokes about bankers' glass eyes were legion. As the market for glass eyes revives - and it is reviving as we speak -new credit creation will inevitably slow down. As Woody Brock recently emphasized, "the combination of diminished bank capital and tighter lending standards could prove fatal to credit creation." Now, it would be naïve to project this set of conditions into the indefinite future. Trust will regenerate over time, and the burdens of research will lighten. The pace of change in that direction, however, will be slow, a matter of years rather than months. An entire structure has crumbled and has to be rebuilt, brick-by-brick. Nor will that process necessarily be smooth. The impact of unforeseen but inevitable credit problems will loom large, detouring and delaying the pace and patterns of recovery on each occasion. There could be bright spots as well. Our whole argument rests on the proposition that the demand for credit is going to exceed the supply, which is blocked by lack of trust and an increased burden of research. But a case where supply fails to respond to an excess of demand is rare in our system. People in finance have extraordinary energy for innovation in new products, new concepts, new paths to ultimate objectives. For example, hedge funds and sovereign wealth funds are already functioning as sources of credit, although a bump along the way might turn them off as well. These widespread and complex problems originated from an unanticipated sequence of shocks involving banking institutions believed to be impervious to losses in the billions and major impairments of equity capital. As we emphasized above, new régimes are colored by the unhappy memories of the preceding régime, and those memories linger on for extended periods of time. The plight of Citicorp and Merrill Lynch reaching for massive help from foreign government investment funds was an event nobody could have foreseen - but few will forget. How the mighty had fallen! The sequence of events that caused the economy to lose its forward momentum over the course of 2007 was unique. This fact is central to our entire argument here. The cause was not too much inventory, not overexpansion in industrial capacity, not a sustained burst of inflation requiring a determined move to tight money and higher rates at the Fed. The root of today's problems in the financial markets and in the economy as a whole is the household sector. The point needs no elaboration, but its significance cannot be minimized. As we have argued on more than one occasion, the shrinkage in the personal savings rate is not the result of consumer profligacy, as other commentators persist in describing it. Rather, the savings rate has been suppressed by a slowdown in the growth of household incomes. The shortfall between income and outlay has been met by borrowing, and in particular by borrowing against the family real estate. Now the opportunity to borrow has shrunk dramatically, an outcome that will profoundly change the household's spending power and spending patterns. But the impact is not just on the household. A slowdown in the growth of consumer spending has ominous implications for the entire global economy - and, along the way, the U. S. federal deficit, soon to be overburdened by spiraling benefit obligations. This predicament is not a short-run matter, unless home prices abruptly reverse themselves and head back into the stratosphere - which is hardly likely. The central message of our analysis is not that the origin of today's difficulties is uniquely in the household sector or that the residue of these difficulties has scrambled the whole credit structure in the financial markets. Everybody knows about these troubles. On the other hand, too few observes have noted how the consequences of these developments are going to require an extended period of time before the blockages they impose have been eliminated. But that is not all they have missed. This extended period of difficulty is going to bring about a new economic régime, different in many aspects from the experience of most people alive today. Along the way, we will have to pass through a transition period that harks back to an unfamiliar past in both the financial system and in the household sector. But this, too, shall pass. Yes, glassy-eyed bankers, prudent consumers, and a reformulated globalization can keep a lid on economic activity around the world for quite a while. What develops from that transition, however, should resemble what took place over the course of the 1980s. Without anyone realizing it, the errors of the past, drip by drip by drip, were buried and a new and better system took their place. The world's markets gambled on financial alchemy. They lost. COME BACK Karl Marx, all is forgiven. Just when everyone thought that the German philosopher's critique of capitalism had been buried with the Soviet Union, suddenly capitalism reverts to type. It has laid a colossal, global egg and plunged the world economy into precisely the kind of crisis he forecast. The irony, though, is that this time it isn't the working classes who are demanding that the state should take over, but the banks. The capitalists are throwing themselves on the mercy of government, demanding subsidies and protection from the capitalist market - it's socialism for the banks. Hedge fund managers of the world unite, you have nothing to lose but your bonuses. On Friday, the heads of the big five British banks demanded - and got - another £5 billion in "emergency liquidity" from the Bank of England to add to the £5bn they received earlier in the week. But like militant shop stewards they complained it wasn't enough. "Look how much the banks are getting in Europe and America," they whinged. Hundreds of billions of dollars and euros are being thrown at banks in an attempt to save them from themselves. The quaint idea that loss-making companies should fail, to ensure the health and vitality of the capitalist system, has quietly been discarded. The banks, we are told, are "too big to fail", which means that they have to be taken into public ownership - like Northern Rock - or have their debts underwritten by government, like Bear Stearns, which comes to much the same thing. The central banks are also cutting interest rates to try to boost banking profits, and this is making currencies such as the dollar increasingly unstable. As it becomes harder and harder to make money out of making things - just look at the collapse in prices of computers over the last decade - so exotic financial derivatives have been created to boost wealth without engaging in recognisable economic activity. Speculation takes over. British manufacturing has collapsed to a fraction of what it was 20 years ago, and a vast financial services sector has grown up in its place making money largely out of inflation in house prices, ie debt. Moreover, with globalisation, trillions of dollars have been washing around the world markets looking for a home. This has created a monster: the market in financial derivatives; a Pandora's box of inscrutable financial instruments governed by supposedly failsafe mathematical formulae. Collateralised debt obligations - implicated in the subprime mortgage crisis - are at least rooted in nominal house prices, but they have been detached from the actual mortgages and sold as commodities in the securities market. Credit default swaps have created a $45 trillion global industry based on nothing at all, merely speculating on the movements of currencies and commodity prices. A credit default swap is a kind of insurance contract taken out between two bankers who bet on the price of an asset. They don't need to own the asset, and there is no actual loss if the default happens. But the contracts can be traded, allowing the swappers to create value out of nothing but their own agreement. According to the Bank for International Settlement in Basel, the global derivatives market is worth some $516 trillion - 10 times the value of all the world's stock markets put together. And much of it is based on very little but leveraged optimism; pieces of paper theoretically based on the price of an empty house in Cleveland, Ohio. Billions have been magicked out of nothing by this financial alchemy, but in the end, there is no way of turning dross into gold, and the reckoning had to come. And someone had to pay - which is where we, the people, come in. As happened in the 1930s, the whole system is collapsing. We are faced with the choice of colossal bank defaults or hyper inflation: saving the banks or saving our savings. The central bankers decided that they would rather save the banks. So our governments are using public money to bolster banking balance sheets and allowing inflation to rip so that the banks' losses will be devalued, along with the pound in your pocket. So what happens now? Or as Lenin said, What Is To Be Done? Well, not Communism for a start. Central control and outright state ownership along Soviet lines is no longer a viable political option - an undemocratic public monopoly is almost as bad as a private one. The fact that the banks are currently in league with western governments to create a kind of financial communism is doubly disturbing. Instead of just propping up bankrupt banks, the governments should be democratising them - mobilising their assets to stimulate the productive economy, repairing infrastructure, researching and developing new markets, and refitting western economies to combat climate change. It needs a kind of green New Deal - an update on Roosevelt's imaginative policies of the 1930s fought tooth and nail by the banks. They want unlimited access to public money to save themselves from the consequences of their own actions; welfare for the wealthy. This is above all a political, not an economic problem. There needs to be a political mobilisation of public opinion to force the banks and the government to bring the people into the equation. Unfortunately, the party that used to perform this function, Labour, has largely been bought out by the banks. They have privatised the government, even as they have socialised the financial markets. I'm sure there are oh at least one thousand people alive and observing the current day and age and even participating a little; one thousand who have the brains to work this out. Some historians believe that history takes vast new courses only due to technology, and not to the politics or the morals, hazardous or otherwise. Given that we have just left Easter, a time commemorating when someone disappeared from a burial crypt and was claimed by some followers and some opponents, to have actually survived death and appeared again in some kind of wall-penetrating yet seemingly physical way... Had this have been an event re-achievable by a truly wide cross-section of the entire world, well just imagine it - all the deeds and misdeeds of normally mortal people would be cause for concern indeed from that point on! I would be investing in powerful painkillers and psychology books, in such circumstances, so great should be the need for them that I could envisage. As it is however, what was a truly widespread innovation among the sons of men, was the invention of the horseshoe - possessed initially by the Visigoths - which led directly to the ultimate collapse of the Roman Empire. History and economics and social conduct are all part of a complex and variegated topographical framework. It is certain that both the weaknesses of the pre-fall Roman social and political panorama can supply numerous pages of description of scholarly interest. In the same way that the basic engineering of a steam engine was known at the time, but took almost two thousand years to be applied by humans properly or even understood for the power that it afforded, it may only be a small step that eludes people's intellectual grasp that provides the difference between the status quo and some genuine New World Order. Octavian, the Venerated Caesar, pronounced the first real New World Order. He was young but gifted with extraordinary insight. You cannot compare people like Cheney or Bush or Obama to an Octavian. And therein lies one clue. It is an absurdity to think that empty heads such as these or the media-obvious loud mouthed egocentric self-opinionated but crass wealthy, can command and control the whole world. History runs its course at first seemingly very slowly. Octavian, were he to live today, would once again have to deal with and make allies of lesser men than himself. Jesus Christ, were he a real individual with volition, would, I submit, be taken to a radical thought, to resurrect Octavian, in this day. Nay, a thousand Octavians, just for good measure. Spinning webs, one by one. Not this particular trading day, will you see the results. but you will see the results. The man in the street is soon feasted on mortgage bankruptcies and the illusion of private palaces. After the feast, the fast. He wants but some bread and some fishes. And dreams of heaven. Aboveall, this he craves. And such cannot be provided by the smaller kinds of men. When Wall Street was great, it provided such dreams. And in cases it actualized them too. Never abandon the hope of winning by investing money; but seek out those of the most courageous thinking, however. They can provide, what none else may. People misunderstand the Greeks when they say 'Christos.' They mean it only, is divine, that is a thought which reaches the heavens and is entertained by what is itself immortal. Even in the most common of the Christian bybli, it says 'render unto Caeser, that which is Caeser's.' It does not avoid the mundane, nor knowledge thereof. Were Jesus to have had a nephew whom he adopted as Caesar did Octavian, such an Octavian, I dare say, could wait a long time to exact a MUCH more exacting account. Why the Fed does not see that revenge can visit them as uneasily, I cannot say. But I would refer them to the chapters in The Republic, which deal with the last days of Democracy, how it happens, and what happens to those who took the high moral ground whilst banging the lowliest serving wenches and debasing the currency. These things are the most certain things of all in history. The Tzar's Winter Palace events, the Killing Fields, The Holocaust. History is almost ONLY about such things. Will they never learn. These things are CERTAIN. Commentary: Contrarian analysis suggests gold's plunge a mere correction in an ongoing bull market. ANNANDALE, Va. (MarketWatch) -- If gold bullion's plunge over the last couple of days is enough to scare you into selling, then join the club. The club of weak hands, that is. The very purpose of sharp corrections during major bull markets is to transfer ownership from weak to strong hands, thereby preparing for the next leg up. And a contrarian analysis of current sentiment among gold timing newsletters points to gold's recent plunge as just a correction. when gold for April delivery fell by 5.9%. That occurred in May 2006, nearly two years ago. Far from precipitating a major bear market, however, that month's correction prepared the foundation that enabled gold to eventually surpass its previous all-time highs. According to contrarian analysts, one way to tell whether a scary decline is the beginning of a bear market, as opposed to a mere correction, is by analyzing sentiment that prevails among gold timers. 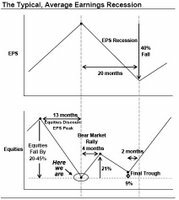 Mere corrections have two distinctive sentiment characteristics: Before the correction begins, bullishness must not have reached excessive levels; and once the decline is underway, there must be an eagerness to jump on the bearish bandwagon. At least one of these hallmarks exists today, furthermore, and the jury is out on the second. Consider the Hulbert Gold Newsletter Sentiment Index (HGNSI), which reflects the average recommended gold market exposure among a subset of short-term gold timing newsletters tracked by the Hulbert Financial Digest. Prior to the current gold correction beginning, the HGNSI stood at 65.4%. That's nearly 35 percentage points below the HGNSI's all-time high of 90%. What will be crucial to watch for in upcoming sessions is how quickly the gold timing newsletters run for the exits. To the extent they do, confidence will grow even more that this is a mere correction in an ongoing bull market. But with early precincts reporting, things are looking good: In the wake of Wednesday's plunge alone, the HGNSI dropped more than 15 percentage points. The Federal Reserve is trying a range of new tricks to push new forms of lending as a means of preventing what they fear may otherwise be a major collapse in financial markets. What all these strategies have in common is an unwillingness to come to terms with the reality that the crisis is based on real factors and can't be merely papered over without grave consequence to economic health. Thus, last Tuesday (March 11), in response to the looming troubles with the Bear Stearns investment bank, the US central bank said that it would offer primary dealers up to $200 billion in Treasury securities for 28 days in exchange for triple A rated mortgage backed securities (MBS) as collateral. As the problems with Bear Stearns intensified and clients started to pull out cash the Fed announced that it was ready to do much more. Last Sunday, March 16, the Fed announced it would provide direct loans to investment banks through the discount window for the first time since the Great Depression. The Fed has agreed to lend investment banks against a large variety of paper securities including a big chunk of difficult-to-trade securities. This move by the Fed came in response to Bear Stearns's cash holdings dropping from $17 billion on March 11 to $2 billion on March 14. The fact that Bear Stearns was rapidly losing cash posed a serious threat to the repo market. In this market, banks and securities firms extend and receive short-term loans that are backed by securities. Fed officials feared that Bear Stearns's dwindled cash situation posed a risk that it would not be able to honor its indebtedness. This in turn could undermine the confidence in the large $4.5 trillion repo market and further damage the credit market. In the end, Fed officials orchestrated the selling of the Bear Stearns to JP Morgan Chase Co for $2 a share, or $236 million. Note that on December 20, 2007, Bear shares closed at $91.42. The main reason given for this deal was to prevent further uncertainty that was poised to destabilize financial markets. Most commentators have endlessly praised the innovative methods that Bernanke and his colleagues are introducing to counter the financial crisis. Bernanke, who has written a lot about the causes of the Great Depression, is regarded as the ultimate expert on how to counter the current economic crisis. In short, most commentators are of the view that the man knows what he is doing and he will be able to fix the current financial problems. Bernanke is of the view that by means of aggressive monetary policy the credit markets can be normalized. Once credit markets are brought back to normalcy, this will play an important role in preventing serious economic crisis. Remember Bernanke's financial accelerator model: a minor shock in the financial sector could result in large damage to the real economy. In short, Bernanke, by means of his so-called "innovative" policy of fixing the symptoms of the disease, believes he can cure the disease. What is the source of the disease and why are investment banks so heavily infected by it? The root of the problem is the Fed's very loose interest rate policy and strong monetary pumping from January 2001 to June 2004. The federal funds rate target was lowered from 6.5% to 1%. It is this that has given rise to various malinvestments, which we label here as bubble activities. When new money is created out of thin air, its effect is not felt instantaneously across all the market sectors. The effect moves from one individual to another individual and thus from one market to another market. Monetary pumping then generates bubble activities across all markets as time goes by. As long as the Fed kept pushing money into the system to support the low interest rate target, various activities that sprang up on the back of the loose stance appeared to be for real. When money is plentiful and interest rates are extremely low, investment in various relatively high-yielding assets like CDO's and MBS's that masquerade as top-notch grade investment becomes very attractive. The prompt payment of interest and a very low rate of defaults further reinforce the attractiveness of financially engineered investment products. However, once the central bank tightens its monetary stance — i.e., reduces monetary pumping — this undermines various bubble activities. The damage from the loose monetary policies of the Fed from January 2001 to June 2004 cannot be undone by trying to fix symptoms. Various activities or financial bubbles that sprang up on the back of loose monetary policies have weakened the bottom line of the economy. This fact cannot be undone by another dosage of policies that attempt to suppress the symptoms. If anything, such policies are likely only to weaken the bottom line further. Remember that nonproductive activities are not self funded. Their existence is made possible by the diversion of real funding from wealth-generating activities. The diversion of real funding in turn was made possible by loose monetary policy. Hence the tightening in monetary stance from June 2004 to September 2007 is what is currently undermining various false activities. Monetary policy manifests itself through the prices of various goods and assets. A price of a good is the number of dollars per unit of a good. When the growth momentum of money supply strengthens, this lifts the number of dollars paid per unit of a good generated by a particular activity — i.e., prices go up. Conversely a tighter monetary stance that slows the flow of money puts downward pressure on the prices of assets, or the prices of the goods of various activities. In contrast, wealth-generating activities that do not need an expansion of money for their existence actually start to gain strength. A fall in the prices of their goods is likely to be less severe than that seen in the prices of the goods of bubble activities. In fact their prices may not fall at all. Remember that wealth generators are engaged in the production of goods and services that are on the highest priority list of consumers. In contrast, bubble investments are engaged in the production of goods and services that are on the low priority list of consumers. As consumers' real incomes fall because of the damaging effect from loose monetary policy, goods and services produced by various bubble investments may not feature at all on consumers' priority list. We suspect that at the moment a tighter stance from June 2004 to September 2007 is dominating the current economic scene. So-called economic growth is always assessed in terms of GDP, which is the amount of money spent on final goods and services. The pace of monetary pumping sets the rate of growth of GDP. A stronger money rate of growth tends to be followed by a stronger GDP rate of growth, while a weakening in the money rate of growth is followed by a weakening in the growth momentum of GDP. The engine of economic growth is not money, however, but real savings. If the pool of real saving is declining or stagnating, then the economy — also in terms of GDP — will follow suit, irrespective of what the Fed is doing. If the pool of real savings is still expanding, then it means that bubble investments in general do not dominate the economic scene. (They can still be dominant in a particular sector or sectors.) This means that commercial bank expansion of credit is not going to collapse and the growth momentum of money is likely to hold its ground. However, if the pool of real savings is falling or stagnating, this could mean that bubble activities are dominating the scene, which in turn raises the likelihood that the commercial banks' expansion of credit will come to a halt. Obviously one can always argue that the Fed could open the money spigots in a big way and flood the economy with money. There is no doubt that the Fed could do it. This does not mean, however, that banks will embark on an expansion of credit if the pool of real savings is falling. Obviously, then, if the pool of real saving is still healthy, Bernanke's policies might "work." In short, after a time lag, financial markets might start zooming ahead and the real economy will follow suit. We suggest that if this were to happen, the recovery shouldn't be attributed to Bernanke's policies but, rather, understood to have happened despite his policies. In the alternative scenario, to which we assign a fairly high likelihood, the pool of real savings is actually falling or stagnating. In the framework of the alternative scenario, Bernanke's policies will only do further damage to the stock of savings and sound capital investment, and plunge the economy into a severe and prolonged crisis. Frank Shostak is an adjunct scholar of the Mises Institute and a frequent contributor to Mises.org. He is chief economist of M.F. Global. Send him mail and see his outstanding Mises.org Daily Articles Archive. Comment on the blog. Just The End of Your Way of Life?